North Charleston agrees to $6.5 million settlement with Scott family. 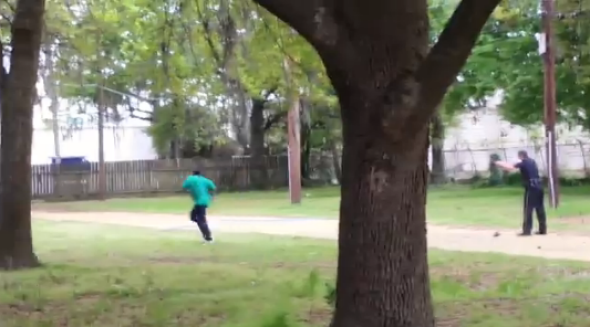 Walter Scott moments before being shot and killed. The city of North Charleston, South Carolina announced Thursday it had reached a settlement with the family of Walter Scott, the unarmed black man who was shot in the back by a police officer in April. The city will pay the Scott family $6.5 million rather than face a civil suit for Scott’s death at the hands of officer Michael Slager, who has been charged with murder and is awaiting trial. “It’s historic,” Chris Stewart, a Scott family attorney, told the Washington Post. “It sets a good precedent for a city not tolerating this sort of behavior from police officers.” The 50-year-old Scott was a father of four and was fleeing from a traffic stop when he was pursued and shot by Slager. A bystander videotaped the incident. “The settlement comes after the City of New York agreed to pay $5.9 million to the family of Eric Garner, whose death after allegedly being put in a chokehold by an NYPD officer was captured on bystander video, and the City of Baltimore agreed to pay $6.4 million to the family of Freddie Gray, whose death in the back of a police transport van prompted murder charges for six officers,” according to the Post.